"Terra Cotta" has been released! The Burnt Earth Ensemble is a musical performing group formed to explore the myriad of sounds produced by ceramic musical instruments. Armed with haunting flutes, growling didjeridus, raucous fiddles and thundering drums, the Burnt Earth Ensemble coaxes tantalizing music from the material of the Earth herself. The group's music is uniquely original, with Celtic, African, Middle-Eastern and jazz influences. 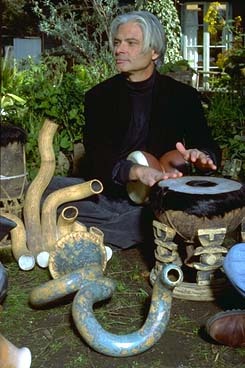 The band members contribute their varied musical backgroundsfrom classical and jazz to rock and world musicto create an improvised stew that uniquely expresses the delicate beauty and raw earthy power of ceramic musical instruments. 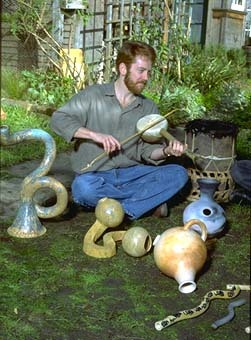 The idea for the ensemble was conceived and developed by Barry Hall, who builds the band's clay instruments. 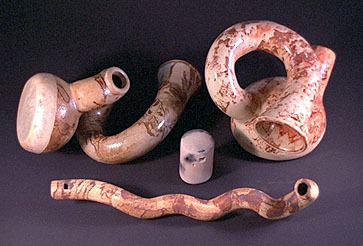 Burnt Earth's collection of ceramic musical instruments ranges from the ordinary to the exotic, and includes many varieties of percussion instruments, flutes, didjeridus, globular horns, trumpets, chimes, and even string instruments. Barry delights in exploring new ideas for musical acoustics, and combining existing systems into new "hybrid" instruments. His didjibodhran, for example, is a combination of the Australian didjeridu, a wind instrument, and the Irish bodhran, a frame drum. Another hybrid, the stone fiddle, is a combination fiddle, flute and drum. 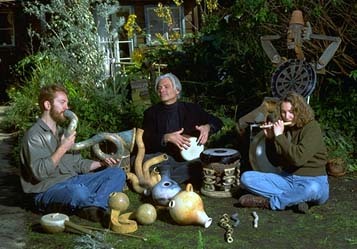 The Burnt Earth Ensemble's first full-length CD, entitled "Terra Cotta," was released in March 2005. The Burnt Earth Ensemble preformed a series of concerts in the Baltimore, Maryland area March 18-20, 2005 as part of NCECA's "Tour de Clay". Click here for details. All material on this page Copyright 1996-2005, Barry Hall. Unathorized use or publication is prohibited.